Birdathon - chronicle all your birding adventures. Birdathon 1.3.1 is available. See what’s new! Birdathon is a tool for recording your bird observations, organizing your bird checklists and sharing them with others. It is designed to be used in the field to efficiently record birds as you observe them. You can quickly record whether a bird is seen or heard and the number observed. The time and location of each observation is automatically recorded. You can add field notes to each observation. You can correct location, time entries and the count of birds observed at any time to ensure your records are accurate. Your checklists can be viewed in taxonomic order (as defined by the American Ornithological Society), alphabetically or as a timeline of birds in the order observed. You can intersperse your checklist with notes and other observations such as mammals, butterflies, wildflowers, etc., to make it into a rich recording of your time in the field. You can organize your checklists into categories such as Day List, Year List, County List, Life List, Big Sit, etc., and assign color themes to your lists. You can send an email report that includes your timeline, all notes you take in the field and a taxonomic list of birds observed. You can view a map of your sightings and include the map in your email report. You can export your checklist as a csv file for import into eBird. Birdathon includes the latest checklists of the American Birding Association (ABA) and the American Ornithological Society (AOS) and covers the geographic range defined by the AOS from their 58th Supplement to the Check-list of North and Middle America Birds. Note: the AOS was formerly the American Ornithological Union (AOU). Birdathon is intuitive to use right from the start, but being familiar with all its capabilities can make it even more useful. Below is a description of the features of Birdathon. Tap "New List" in the upper right corner to start a new list. You will be shown the New Checklist View, which contains of templates to use as starting points. Pick the one most appropriate for your intended use. The New Checklist View displays all the list templates available to you for creating a new list. You can import new templates or create your own custom templates (more on this below). When you're out in the field, you'll spend your time in Checklist View, adding observations to a checklist you created at the start of your adventure. Checklist View shows all the birds added automatically by the template, but it's very easy to add birds not shown on the list, or to delete birds from the list. You can mark a bird as seen or heard right from the list by tapping the checkbox to the left of a bird. This will bring up two larger buttons for [Seen] or [Heard] birds. Each tap on the buttons bumps the observed count by one. The checkbox will display a check mark or a musical note depending on which button you tapped, and the count for that bird will be displayed in parentheses after the bird name. Birdathon helps ensure that birds are not accidentally counted by unintentional taps, while making it easy and fast to bump up the count. If you want to bump the count by more than a few, or you'd like to add notes or fix an entry, you can use the Detail View. Tapping on a bird name in the Checklist View will take you to the Detail View for that bird. This view lets you add more information to your bird sighting. If you just saw 100 Sandhill Cranes, you might prefer to type "100" rather than tapping the Seen button 100 times! If you want to add a note to a particular bird sighting, you can tap on the name of the bird to be taken to the Detail View. Here you can write a note, bump the count of birds seen, star the bird or edit the individual observation records. I've been using paper checklists since I started birding many years ago. Usually I would just pack a pencil and a folded blank piece of paper in my pocket and write down the birds as I went along. I would often forget to write the time and location down. I also rarely marked the count for a species or new locations where I observed a species for a second time. I also tried using preprinted lists, but those had the disadvantage that it took time to find the bird on the list before checking it off. It was fast enough if I had an idea where the bird might be on the list (like House Finch, which was generally near the bottom) or if the list was short, but could slow me down if I was less sure (where is American Dipper again?) or if the list was long. When I set out to write an app, I had some clear goals: I wanted it to be similar to traditional paper lists, but it had to be better, faster, more accurate and more organized than paper. I also wanted the ability to record other observations such as mammals, reptiles, insects and flowers, while still keeping the focus on birds. I wanted Birdathon to be as easy to use as a paper list. I wanted it to work without an internet connection. I did not want to have to sign in to an account to use the app. With Birdathon, I can instantly find any bird just by typing a few characters in its name, or by typing its four-letter banding code. For example, even in the AOS list which contains 2,143 species, typing ‘blp’ brings up only two species: Black Phoebe (whose code is ‘blph’) and Blackpoll Warbler (‘blpw’). In Birdathon, my disorganized pile of bird checklists becomes an organized table that I can view by type, date created, date modified or alphabetically. It’s easy to find a list from a particular outing just by scrolling through the main view. And when I send an email report, my write-ups are rich in detail and read almost like a story. Birdathon checklists are compatible with eBird. There are two ways to export checklists - you can send an email containing a text file in eBird's Extended Record Format, or you can export that file directly to iCloud, DropBox or anywhere that iPhone lets you save files. Once exported, you can import your checklist into eBird. So why not just use eBird? Some checklists that you keep may not be suited to be eBird reports, such as a vacation list or just a list of all the birds you've seen in a day. You might also want to keep your life lists and other specialized lists as local data, rather than being on eBird's website. Every list you create in Birdathon stays with you, whether you have an internet connection or not. Birdathon records the time and location of every observation, as well as whether the bird was seen or heard at that time. eBird stores a single location for your entire list. Birdathon lets you add notes to your timeline, so you can better record activities such as moving to a new location or changes in the weather while birding. This data is not used in eBird. Birdathon also lets you record observations of mammals, butterflies, flowers, basically anything you want. This data can be a great way to enrich the description of your birding adventure, but it is not saved in eBird. Any list of birds you create or modify can be the basis for a new bird template. Just choose “Create Template” from the share menu (in the bottom right of the Checklist View), give the template a name and tap “Create Template.” After that, any time you create a new checklist from the Main View, your new template will appear as one of the starting points for a new checklist. For example, if you just spent the day birding your neighborhood, you could use that checklist to make a new template called “Neighborhood Birds.” Then, when you go out birding the next day you could create a new list using the “Neighborhood Birds” template. That new list would only have the birds you saw the previous day, so it’s concise and relevant to your new day of birding. If you see a bird today that you didn’t see yesterday, it’s easy to add by tapping the + button and choosing “Add a Bird.” If you end up adding several new birds, you might want to use this new list to create an updated Neighborhood Birds template. New templates can be created from the observed birds on your list or you can create a new template from all the birds on a list. This is useful, for example, if one of your existing templates is close to what you want. You can create a new checklist, delete some birds, add some birds and then create a new template from the full list. In addition to creating templates from your existing checklists, you can import lists of birds. You can use any text file containing a list of common names of birds, or any csv (comma separated values) list whose first values are common bird names. For example, eBird Record Format files would work. We've provided a few examples of Birdathon-compatible checklists along with detailed instructions for you to learn how to import checklists that are posted on a website. You can import lists sent to you via email. 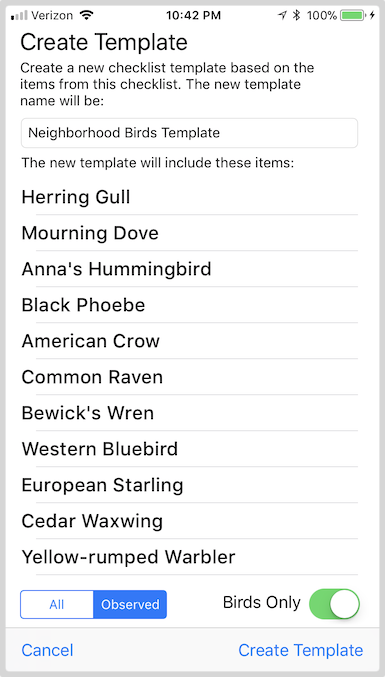 If someone sends you a list of birds enclosed in a text file, you can tap on that file on your iPhone, then tap the Share button and choose “Copy to Birdathon.” Birdathon will create a new template whose name matches the file name of the text file. You can also import by tapping the “+” button on the Main View to bring up the New Checklist view. Then tap on “Import a Template...” at the bottom of the list of templates. This will bring up a file browser that lets you navigate to wherever your list is stored (iCloud Drive, Dropbox, etc.) and import simply by tapping the file. You can send support questions and feedback to birdathon@voyageropen.com.